An interdisciplinary cancer research project headed by two UT professors is customizing vaccines to battle the elusive disease. 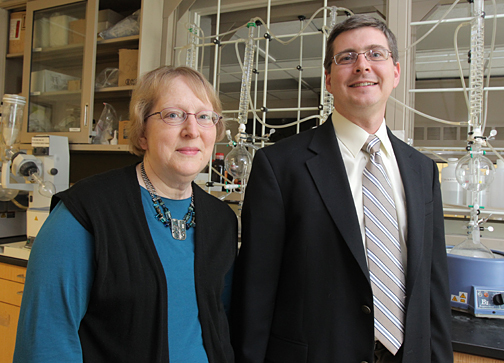 Dr. Katherine Wall and Dr. Steve Sucheck are combining their specialties to investigate vaccines to fight cancer. The synthetic vaccines under development are not intended to prevent cancer, explained Sucheck, but to bolster the response of the body’s immune system — since from a treatment standpoint, one of cancer’s most frustrating characteristics is its ability to become resistant to that first line of defense. To understand those defenses, the body’s internal battlefield should be briefly delineated. In order to successfully repel invaders such as bacteria, viruses and tumors, the immune system depends in large part on antibodies: large Y-shaped proteins that identify and neutralize foreign objects. To mount an attack, the antibody must recognize a unique part of the foreign target, called an antigen. Enter the antigen-presenting cell; these specialized white blood cells send a signal to the immune system when an antigen enters the body. Once this happens, an antibody is produced that can tag a cell for a strike by other parts of the immune system. Cancer, however, is able to hide its presence by causing cells to stop presenting antigens, or by changing its antigens. Vaccines to strengthen the immune system are not a new idea, Wall noted. “But we are studying new ways of synthesizing and incorporating sugar-containing peptides, called glycopeptides, into vaccines to be used for cancer therapy. Our approach makes use of antibodies already present in most people to help target the vaccine to the immune system. To cause the cancer-striking antibodies to spring into action, the team packs the vaccines with targeting molecules not normally found in the human body; thus, cells encountering them make antibodies against them. This is where Suchek’s chemistry expertise is invaluable and where his lab crew faces new challenges as they attempt to chemically synthesize targeting molecules specified by Wall’s immunology side. Ultimately, the vaccines could be used to augment existing treatments for cancer by eliminating the cells that may escape initial chemotherapy and surgery, he added. Wall said, “Steve is a very good chemist who can make anything we can think of, but he’s also interested in immunology, where I have many years of experience. It’s a very interdisciplinary project and because it’s an AREA (Academic Research Enhancement Award) grant, it’s intended to support the training of graduate and undergraduate students in addition to the research. This entry was posted on Thursday, June 2nd, 2011 at 4:30 am and is filed under Research, UToday .